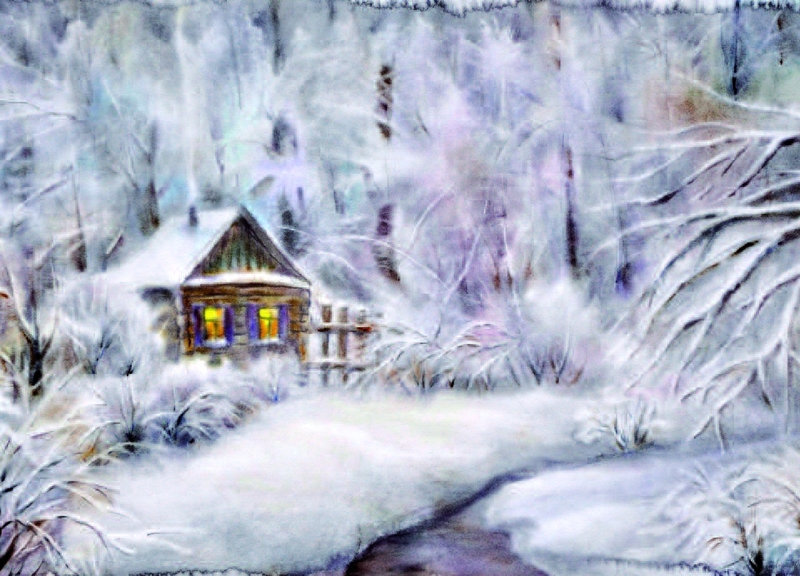 "I admire the watercolour paintings by Alexandra Otieva! They have a lot of light, colour, style and soul! " Alexandra Otieva was born in Saratov. Since 2004 she lives in France. She works in watercolour on a wet paper. In her portfolio there are more than 200 works. Some of them took a rightful place in private collections in Moscow, St. Petersburg, Saratov, London, Monaco, Nice, Paris, Boston, Montreux, Geneva... 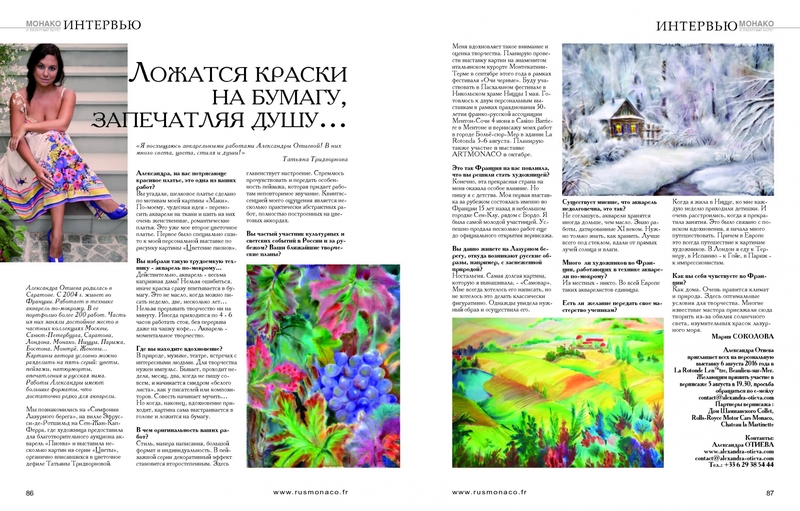 The author's paintings can be divided into five series: flowers, landscapes, still lifes, impressions and Russian winter. 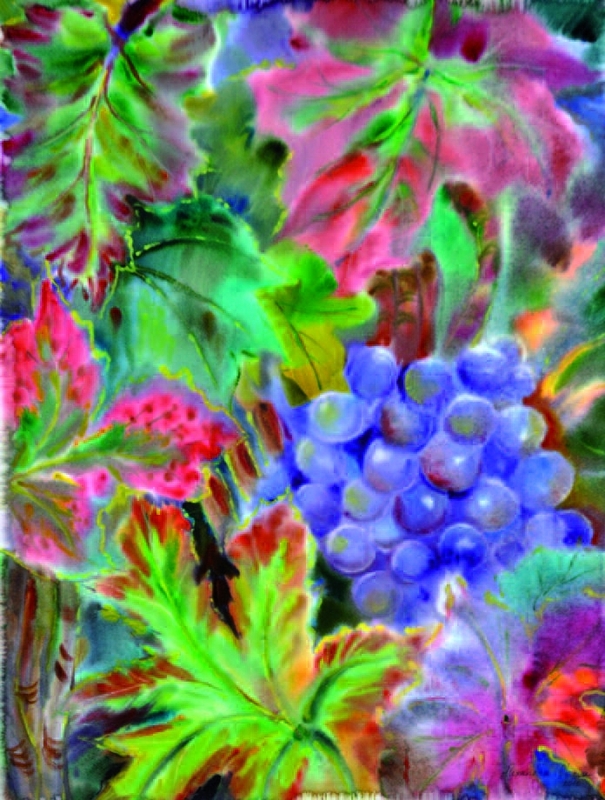 Alexandra's works have large formats, which is a rare thing for watercolours. We met at the "Symphony of the Côte d'Azur" at Ephrussi de Rothschild villa at Saint-Jean-Cap-Ferrat, where the artist exhibited her watercolours for the charity auction "Peonies" and presented several paintings from the series "Flowers" that blend seamlessly into the flower show of Tatiana Tridvornova. Alexandra, you have a stunningly beautiful dress, is this one of your works? You are right; the silk dress is made themed on my painting "Poppies". In my opinion, it is a wonderful idea – to transfer watercolours to fabrics and create very feminine, romantic dresses from them. This is my second flower dress. The first was made especially for my personal exhibition and was based on the picture "Peonies in bloom." Indeed, watercolour is a very capricious thing! You cannot be mistaken; otherwise the paint is immediately absorbed into the paper. This is not as in the case oil paints, when you can paint for a week, two weeks, several years ... You can not interrupt creativity for a minute. Sometimes it takes 4-6 hours to work standing up, without a break, even for a cup of coffee ... Watercolour is an instantaneous art. Are you a frequent participant in cultural and secular events in Russia and abroad? What are your nearest plans for creativity? I am inspired by such attention and appreciation of my creativity. I plan to hold an exhibition of paintings in the famous Italian resort of Montecatini Terme in September this year within the framework of the festival "Dark Eyes". I will participate in the Easter Festival in the Nikolsky Church in Nice on the 1st of May. 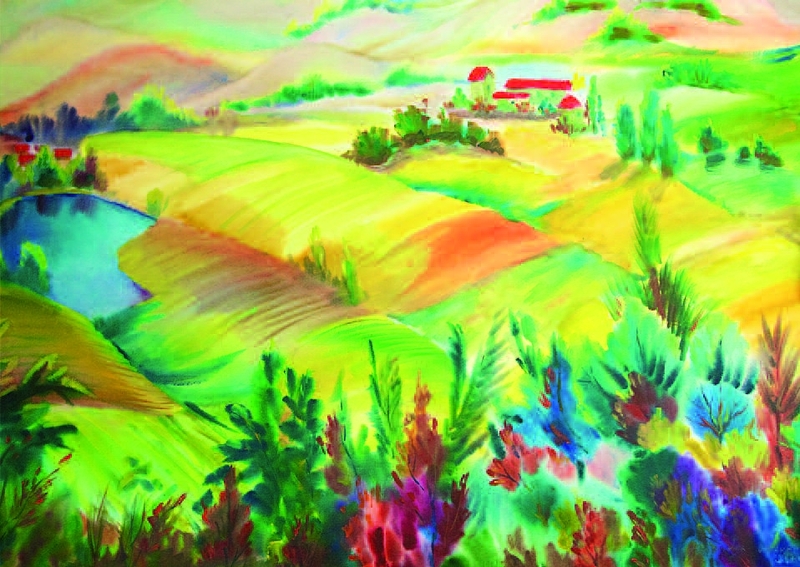 I am preparing for two personal exhibitions to celebrate the 50th anniversary of the Franco-Russian association Menton-Sochi which will be hold on June 4 at the Casino Barriere in Menton and the vernissage of my works in the town of Beaulieu-sur-Mer in La Rotunda on August 5-6. I also plan to participate in ARTMONACO in October.